Design + Decor Inspiration from LA via Melbourne. We have just been inspired by listening to the designer seminars at Design + Decor in Melbourne late last week. Also realised how much we had missed doing posts to help inspire you & that in doing so it inspired us – the best reason of all to post! 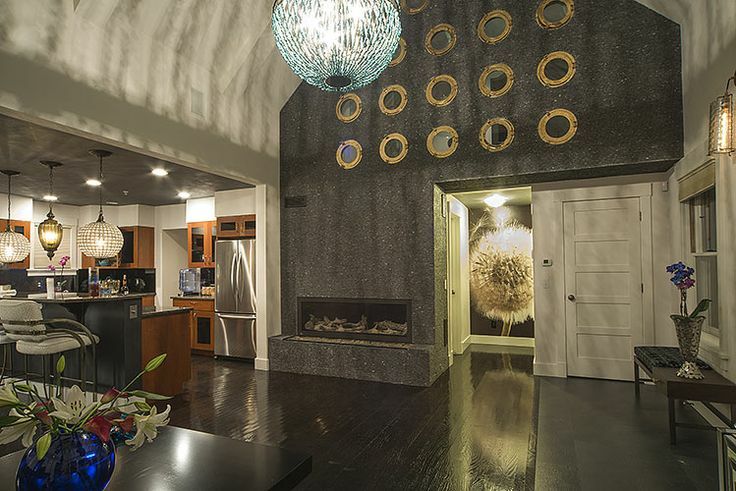 Kari Whitman used portholes and a mix of lighting to liven up a kitchen and living space. The portholes allow light to filter in to the space behind the wall. She bought them for $25 from a salvage yard. Clever & Green! Most of the presentations reinforced the thinking that no house or job for an interior designer is ever the same. The work of an interior designer should not look the same from client to client, house to house. An interior design should not have a signature style – the style of a house is dictated by the client. Design should not be a copy cookie-cut that is pasted onto each client’s house. The job of an interior designer is to help & guide clients to create what they want. It is a collaboration between the designer, crafts people and client. It is the mix of old and new and art in a room. Kari Whitman cleverly mixes up vintage furniture with shiny new side table and art. In the words of Kari Whitman it is about adding ‘Wisdom” to a room, mixing up old and new and also making it pet and eco friendly. Kari Whitman is an interior designer to the stars in Hollywood and she will search the client’s existing inventory before buying a single piece of furniture. She cleverly mixes older or fun pieces in to create an interesting vibe and wow factor in a room. 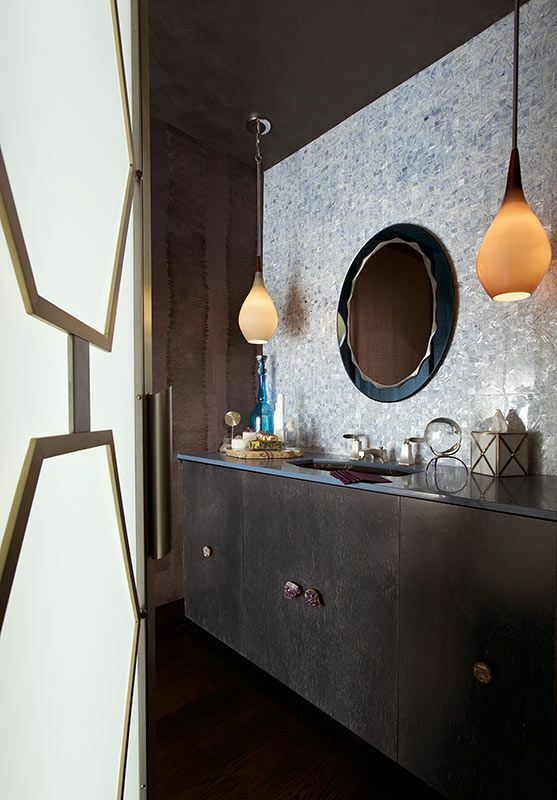 In this powder room by Kari Whitman the vanity has been given vintage knobs & vintage lights were used to add visual contrast to the stunning tiles. By using and recreating an existing or old piece in a room you are not creating landfill. The piece should always have good lines and be able to contribute something to the room in terms of scale and style. It is turning trash into treasure. By using pet & family friendly materials and fabrics throughout a house people are able to relax and enjoy their space without fear of it being trashed by our four legged friends. So think about being practical and friendly to our pets and the environment – its another inspiring way of reinventing your space. 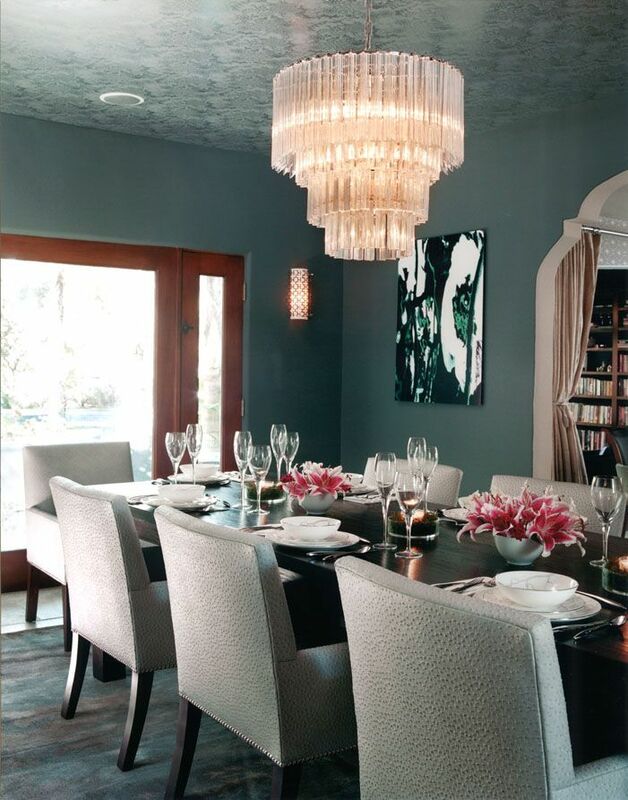 Kari Whitman has created a beautiful dining room with a vintage chandelier, interesting art & ceiling & gorgeous colour. Note the spaghetti bolognaise friendly covers on the dining chairs! If you would like help reinventing some of your furniture please feel free to contact us. This link below has an interview with Kari at Design + Decor Melbourne, from DesignonLine Blog. Thank you for sharing! glad you enjoyed the show!